Kids with autism usually struggle socially and often find the teen years especially difficult. Anxiety and depression can emerge or worsen, along with a sense of helplessness, worthlessness and loneliness. Mental health professionals often refer these teens to social skills groups. These groups teach lessons about how to “appropriately” interact in a neurotypical (NT) world. I’ve led these groups myself, and have found them useful. But I also noticed the teens really just wanted to talk to each other—to have a safe place where they weren’t judged and where they could hear echoes of their own experiences in others. They rarely showed much enthusiasm for the actual “lessons”—and hardly ever practiced them at home. Dr. Moore (DM): How did DC Peers get started? Catherine Robertson (CR): The idea came from my wish for a place my son could “hang out” with kids his age—somewhere he was not only welcome but where he was excited to go. Somewhere “cool.” I wanted a place that felt natural and part of the community—not a doctor’s office or clinic. And I wanted him to have someone his age would be willing to be honest with him, and kind of coach him socially. My first idea was simple (I thought! ), just have a mentoring group. I’d find socially adept kids to mentor kids like mine and teach them the ways of the world. Because kids in high school no longer want advice from their parents. DM: I think all parents want this for their kids—a safe place for them to be themselves and have fun. I love your idea of getting peers involved. I always thought this was the way to go. Mentoring is vital but doesn’t require a professional. It just takes someone who cares and has some knowledge of autism. Sometimes we make it more complicated than it has to be. CR: Exactly. In fact, I tried twice before to get something going. I had neurotypical kids excited about being peer mentors. But Walter’s school administration wouldn’t get on board because of liability concerns. It was so frustrating! So I decided to start my own program based on volunteers and with no bureaucracy. And I wanted it to be free. Right now, too often the only kids who get access to social skills support are those whose parents have resources unless they’re lucky enough to be in a really good school district! I got a nonprofit status so that I could give student volunteers “community service hours.” In DC kids need 100 hours of volunteer service to graduate, so this seemed like a natural fit. And this is important: I give both the “typical” and the autistic teens community hours—because they are building awareness of neurodiversity together. It motivates all of them to think of this as a service to the community. DM: Sounds like a great plan. How did you structure it? CR: Right—I needed to figure out how it would actually work! One of the things I wanted to avoid was having the volunteers just “be nice” to the spectrum kids. My daughter (and co-founder) Sophie calls this the “Best Buddies” problem. I wanted to see real learning and genuine understanding develop. At the time, Walter was doing a program developed at UCLA called PEERS (Program for the Education and Enrichment of Relational Skills). I liked the way it broke down basic social situations into sets of rules and steps. But I thought if Walter could practice these situations in a safe environment with more skilled peers, he would benefit even more. If, for example, he was learning to join group conversations, he could try it a few times, make mistakes, and get supportive feedback and suggestions from these peers. Watching Walter try PEERS, I realized that curriculum could be the structure for my mentors. So in the fall of 2016, I traveled to LA and became a Certified Provider. DM: Kudos to UCLA for allowing you to adapt their program and make it your own. So once you returned to DC, what was next? 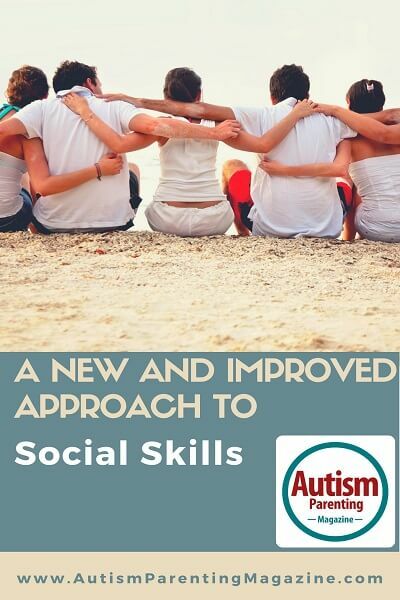 CR: Then I started recruiting teens with autism for my pilot program. I held a meeting for interested parents, and all but one, whose child was too young, signed their kids up! Then my daughter pulled together a focus group so we could see what would convince a neurotypical high school student to volunteer. We wanted feedback on the idea, but instead of giving me feedback, they all just signed up! Without even trying, we ended up with twice as many kids as I had envisioned, 50% on the spectrum and 50% neurotypical. DM: How excited you must have been! But you were also wading into uncharted territory, that must have been a bit daunting. CR: As I told all the parents and the kids from the beginning, what we were doing would be an experiment. That approach seemed appealing; we were all working together to build something. We scheduled our first meetings to run for five months and called it a “club.” We sometimes used the PEERS lessons and sometimes expanded on them. For example, once we took a long time talking about a difficult situation that had come up for one of the members. We brainstormed how to handle it, which the participant found to be a big relief. DM: I think jointly solving a real-life issue in real time is what bonds people. Did the kids start to develop relationships with each other? CR: Well we followed the PEERS rule preventing contact outside the group, but the group developed real comfort with each other. We offered a few optional social activities with no agenda other than to have fun. We had a trivia night and a picnic in a local park. Almost everyone came, and it was clear the kids had come to like and trust each other. By our fifth month, the kids were all very comfortable with each other. Some were set to graduate from high school, but all of them still in school wanted to come back after the summer and do the group again. So I had to come up with a new curriculum for “Club Peers 2”! DM: That says a lot. What did you come up with for the 2nd year? CR: I realized one critical goal I hadn’t met: helping the kids learn to coach each other based on knowledge I shared with them. I had hesitated to ask NT kids to actually advise the autistic kids because I’d set up the group as one where everyone was on the same level. The idea was that we all struggle with social skills. That’s true on one level, but not entirely honest. That summer my daughter and I attended a seminar on neurodiversity. We resolved to improve Club Peers using what we learned, and that meant not glossing over differences, but actually talking about them explicitly. The second year we held two trainings before the club restarted. One was for the neurotypical teens to help them understand the neurology of autism. I wanted them to have insight into the source of the behaviors and social blindness they would see. Then we held another training for the teens with autism. I wanted them to understand the “typical” brain. I wanted them to know the neurological reasons that other teens find socializing so easy and fun. In each training, I explained how brains are wired differently and how each has unique strengths. I taught them about how certain parts of the brain impact things like eye contact. This resonated with them and proved very popular. I also really wanted to them see the bigger picture – that because these “typical” teens are in the majority, our culture has said “neurodivergent” kids should learn “typical” behavior. But that is an enormous task, and we are putting the burden all on them. Imagine how much easier, and less anxious, the lives of the autistic would be if their community understood them? DM: That is what I really love about your approach. I sense you treated all the kids with respect and trusted that they would be able to understand and appreciate information that, in my opinion, therapists often do not explicitly share with their clients. CR: Well, the kids have certainly responded with enthusiasm, and they keep coming back, wanting more. And parents are noticing more confidence and the willingness to try some new things. DM: I wonder if you could give a couple of specific examples of group experiences that stand out for you. CR: Well, last year as the group got more comfortable together, we laughed a lot, which made practicing social skills more fun. We got to the point where everyone was OK trying awkward things (like joining group conversations, or telling jokes, and getting feedback from the whole group, which was exactly what I’d hoped for. I’ll never forget the expression on one girl’s face when she was trying to pretend she found my joke funny. Another moment was at one of our trainings, when a young autism advocate who is working with us this year (Joel Carver) was trying to help our typical volunteers understand autism better. He asked for a neurotypical volunteer and handed her a chair. While she held it, he described how it feels to have a passion that you really, really want to talk about and can’t. And that pressure to talk about it stays with you all day—all through class, after school, and throughout most social situations. You hold that chair the whole time, and it gets heavier and heavier. The only time you get to put it down is when you can finally talk about what you love. After what we had learned about how the neurotypical brain gets pleasure from socializing in a way that many autistic brains don’t, someone in the group said that hey, maybe for neurotypicals, socializing is that chair! We all agreed we need to figure out what our “chair” is. DM: I have two last questions. One is what you would tell other parents who have teens resistant to getting together with other kids. The other is what has been the most powerful to you personally in doing these meetings. CR: To your first question, I too struggle knowing how much and when to push. I think the best approach is to help them feel safe to reach outside their comfort zones, little by little. One mom said to me she was afraid her son would leave after five minutes or start to scream. I told her that was fine if he did and in fact, Walter had done that, and that this was a group where we all knew why that might happen. To answer your second question, I’ve learned that both groups of kids love discussing their lives with other kids and widening their perspectives. It’s been powerful to see all the kids—both neurotypical and autistic—understand themselves and each other better. I want to foster talk about autism as a difference—and a really interesting one—not just a disability. We’ve done that in our meetings. I really do think that most people who encounter an autistic person want to understand and help. And I think teaching neurotypicals about autism is the best possible way to help people with autism. It’s a work in progress, and the kids and families are willing to go along for the ride, so I’ll keep experimenting and learning! Debra Moore, PhD, is a psychologist who, prior to retirement from active practice, worked extensively with children, teens, and adults on the autism spectrum. She coauthored The Loving Push: How Parents and Professionals Can Help Spectrum Kids Become Successful Adults (2016) with Dr. Temple Grandin. She contributed two chapters (one coauthored with Dr. Temple Grandin) to The Nine Degrees of Autism (2015) and wrote the chapter Internet and Gaming Addiction in Youth on the Autism Spectrum: A Particularly Vulnerable Population in Internet Addiction in Children and Adolescents: Risk Factors, Assessment, and Treatment (2017). She also facilitates the groups “Autism Spectrum Across the Lifespan,” and “Autism Spectrum HELPING HANDS Mentors” on LinkedIn.com. I’d love to start something like this in virginia. My daughter is 25 so it would be for older kids though! any advice?